Writing a 500 word essay paper is not as simple as you may think at first due to the small length of the text and creative character of the task. 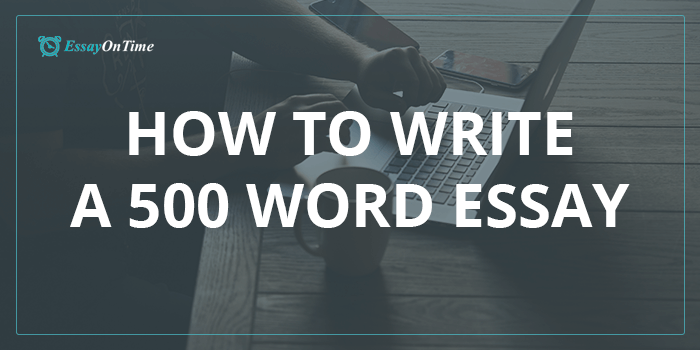 Thus, every student stumbles upon a question “how to write a 500 word essay”! How to find the answer? In this text, you will find the answer to the most commonly asked questions, learn more about this type of paper, and get some practical tips that should help you with writing an outstanding essay! How Long To Write A 500 Word Essay? This is one of the most often concerns. As a rule, such type of task is given with a short deadline or can be included in the exam or test to evaluate students’ ability to provide informative and full answers to the questions. In the first case, you will be given not more than one day to perform the task. But if it is a part of the exam, you’ll have to deal with it much faster – as a rule; students are given about 30 minutes to write the answer. How To Write 500 Words Essay Faster? Study the question. Before you can give a good answer, you have to understand the question! If you more time – devote it to the research and try to learn more about the theme of your paper, read different opinions on this matter, etc. Plan your answer. You will not miss out anything important if you have a detailed outline before you start custom writing and thus, you should always make a plan, even if you have only 20 minutes to finish the whole work. Include examples, quotes and other proofs. An essay is a type of work that reveals the author’s personal viewpoint, but it also has to show that this opinion is logical and correct by means of supporting it with valid facts and evidence. Keep it short. Always keep the volume in mind and try to make each sentence of each paragraph concise and straight to the point in order not to exceed the required number of pages. Revise the text. No matter how much time you have left before the deadline, you have to re-read the whole work to check it for mistakes in grammar, syntax, structure, etc. How Many Pages Is 500 Word Essay? Some young people have certain doubts regarding this matter. Often it happens with those who had to make an assignment for the first time and find it difficult to orient on the number of words in the text.However, everything is less complicated than you think! If we keep in mind a standard format for this work, then 500-word text should fit on two pages (it can be a bit less but not more). How many sentences are in 500 words for paper? This question is harder to answer. Everything here depends on the length of each sentence, but you can confidently forget about this concern because it does not matter how many sentences are in your work! Where To Get Assistance If You Can’t Perform The Work? Even if you have already found answers to the questions like “how long is a 500 word essay” or “how to write 500 words essay” it does not mean that you can create a flawless paper without any practice! Just like any other skill, academic writing requires you to practice and improve your technique, and only this way you can reach success! What if you lack these skills, but the task has to be done immediately? Even in this situation, you should not despair! If you are not able to finish the work on time and write a text of the high quality, you can turn to a professional 500-words writing company for some extra help! The good news is that EssayOnTime.com.au is one of such essay writing services! If you need a well-written text, created in accordance with all your requirements – we are the best company to request such services from and we guarantee that you will be more than happy with the result!